This 5,300 sq. 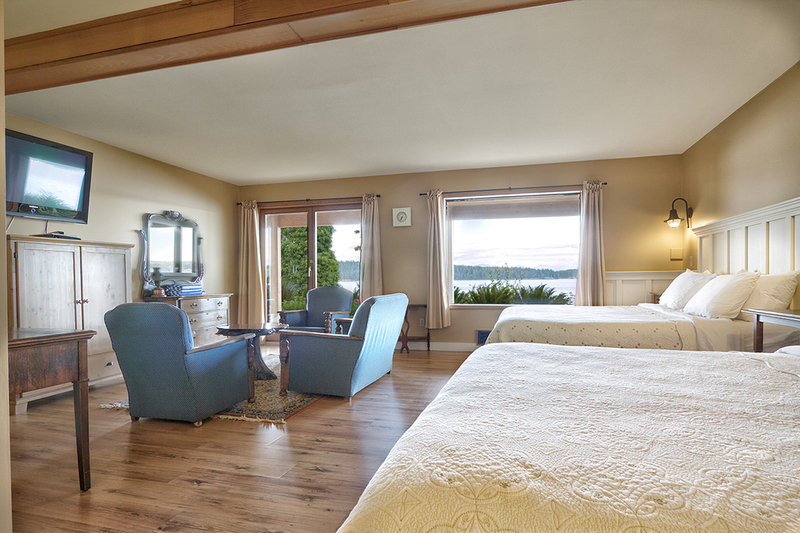 ft. lodge is beautifully furnished with antiques, luxurious quilts/duvets and features a million dollar view of Discovery Passage and the Coastal Mountain Range. 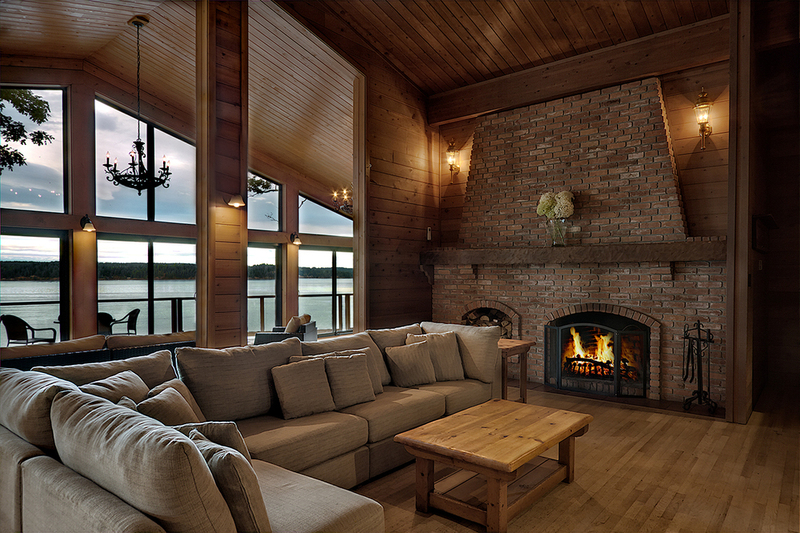 When rented for accommodations and not during wedding stays (see below), the main level of this lodge offers a spacious open concept living space with a fully equipped gourmet kitchen, dishwasher, flat screen cable tv and a grand brick wood burning fireplace. An evenings firewood included. 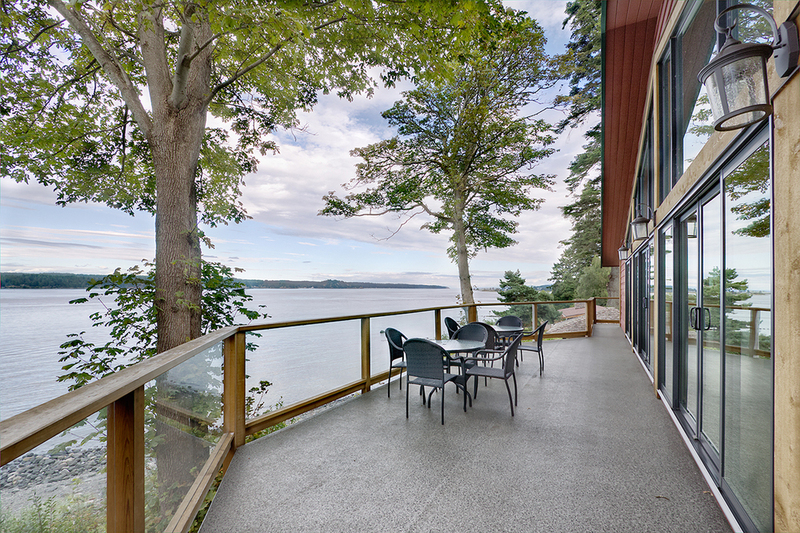 This wheelchair accessible cabin has four ocean view spacious bedrooms each offering a private full bathroom, sitting area and a 42" plasma screen cable tv. The two lower level bedrooms have two kings in each, while the third lower level bedroom has a king and double bed. 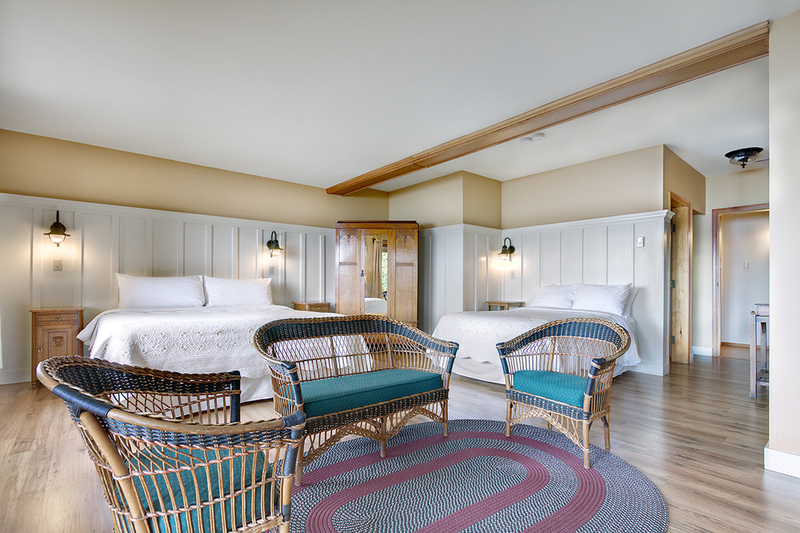 On the main level, the exterior entrance fourth bedroom has two double beds and a cozy wood burning fireplace. Additional comforts include a billiards room, wet bar and a huge private oceanfront deck perfect for viewing breathtaking sunrises and sunsets. Enjoy the panoramic unobstructed views while relaxing and soaking in the spacious 8 person hot tub. Discovery Lodge is situated in a prime location on the edge of the ocean, overlooking our private beach. This is a perfect setting for a group gathering, corporate retreat, family reunion or wedding. For more info on hosting group events in the Discovery Lodge, please click here. For Discovery Lodge current accommodation and venue rental rates, please inquire by e-mail or call us directly, 1-800-891-0287. Maximum cabin occupancy of 8 guests. Rates do not include tax & additional guests are $20 per night. plus tax, when applicable. Children 6 years and under stay free. Reservations require 50% deposit, which are refundable prior to 90 days of arrival and subject to a $25 admin fee. Cancellations after 90 days are non-refundable. There is a 2 night minimum stay on weekends and during the summer (June 15-Sep 14). BBQ's are available for an additional $15 per night. All cabins have complimentary wireless internet and are non-smoking. Please note that pets are not permitted in the Discovery Lodge. During the hosting of Destination Weddings, the upstairs/living space of Discovery Lodge is transformed beautifully into the reception/event space used for catered events only. The 4 Discovery Lodge Bedrooms are directly below & next to the Venue Space (used for the Reception & all indoor catered events). The upstairs venue space will not be accessible for guests staying in Lodge bedrooms however all 4 ocean view bedrooms have their own TV, sitting area, coffee station & bar fridge. The Discovery Lodge event set up and tear down will be taking place during mornings and evenings during wedding stays.